Good Day everyone, thanks for your lovely comments yesterday it is such fun reading them and I feel as if I have made lots of new friends whilst hosting the Advent Calendar, so many of you have visited us everyday from the start. I am going to ask a question today but don't feel you have to answer I know how busy you all are, so if time is tight just leave a comment - Here it is -What colour do you use the most in your cardmaking? Just leave your answer or comment below to be in with a chance to win todays lovely Whiff of Joy stamp. Check back tomorrow to see what the surprise behind Window 19 will be. Congratulations go to Heather from Enchanted Stamper today, Random.Org choose her Number - 4 - could you please e-mail us your address Heather so we can get your lovely Lizzie Stamp off to you asap. Don't forget to be in with a chance of winning todays lovely Whiff of Joy Armchair stamp leave your comment or answer to todays question at the bottom of this post and check back tomorrow at 00:01 GMT to see if you have been lucky. This card is so royal:))) Loving it!!! The color that I seem to use the most in my cardmaking is Pink. I use purples and pinks most I think. A real challenge for me is to make a blue card. Every time I have to make a blue card it's like I don't know how to make cards, lol. I usually have reds or blues in my cards. And LOVE your card here Katharina. What a gorgeous chair! How fun! The color that I use the most are pink/peach tones, as well as black touches! Love the card. The color that I use most is purple. Thanks for the chance at another stamp. krista P.
I really love this card!!! The colors are use the most are brown pink and blue. 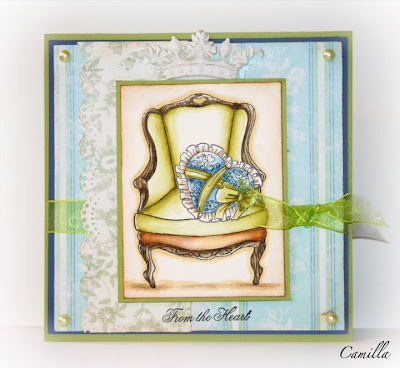 This card is gorgeous - another stamp with loads of possibilities!! I guess I use pink shades the most although I am breaking out of that mould and experimenting with colours I am "uncomfortable" with. Lately it seems like everything I make needs a little "Stampin Up - Riding Hood Red" cardstock. But overall my all time favorite is Kraft colored paper - the best neutral ever!! Wow, today's card is just drop dead gorgeous. The color I use most would be brown. It can be nicely combined with variety of other colors for different occasions. What a lovely card! Although everyone I've seen so far has been beautiful! Your card is just beautiful and the stamp image is wonderful. I just love purple and any shade, but making cards I use all colors. Thanks so much for a chance. Also thanks so much for hosting this fun holiday giveaways. LOVE the coloring on this chair! Wow! I've turned into a brown person, which is bizarre for me, but I use a lot of green and blue. This is a beautiful card. As of lately I have been using blue more than any other color. Very pretty card!! Love the colors in it!! I would definitely have to go with brown. As a kid I hated that color the most but now it is my favorite!! Thanks for a chance to win this cute stamp!! wow- I got on here early! I would have to say the color that I use the most right now is greens (olive, celery, etc....) which is funny cause I am not a green gal. PINK is my favorite. Beautiful! This makes such a lovely card! I use greens/blues the most! I have found myself using Cranberry from CTMH most. I really love it. I seem to be using pinks and greens a lot. This would make a lovely card for many occassions. Thanks for the ideas. I use a shade of green on pretty much every card I make. I just love the new SU kiwi kiss, and also the retired SU Wild wasabi. Beautiful stamp and card today! Oh that would be the coolest bday present ..... I turn 38 on the 18th .... eek ... I'm scaring the heck outta 40! Not much luck with these though, I should be so lucky to win something so beautiful on my bday. Good luck to all the ladies! On my colors I tend to favor in cards ... I have three ... Blue, Red and Pink. Keep the awesome cards coming. The most color i use is pink. Eine tolle Karte, ch bevorzuge bei meinen Karten rosa und blau mit braun. colors, it would have to be in the red/pink family. I have far more of these than any other family of colors aside from neutrals. I love color and I really love red. Thanks for thechance to win stamps! ich nehme oft braun, rosa und lila. zur weihnachtszeit natürllich auch die klassischen farben. The color that I use most is brown. Thanks for another chance to win this awesome stamps. Beautiful card! It looks almost regal! I use mostly orange and red, they aren't my favourite but I've a lot of card, papers, ribbons in these colours. My favourite color is pink! I use a lot of colours but I think the ones I use the most must be warm brown and autum colours. Eine wunderschöne Karte ist das mal wieder und der Sessel und das Herz sind wunderschön! Ich bevorzuge Pastell oder warme Farben und gerne kombiniere ich diese Töne miteinander. Wow,wieder so eine traumhafte Karte! Ich staune was man aus so einem Stempel tolles machen kann! Also im Moment nehme ich viel rot und grüntöne sowie gold! Grün mag ich eigentlich nicht so,passt ja aber super zu Weihnachten!Ich mag sonst aber sehr gern helle Farben vor allem mag ich rosatöne! This card is gorgeous! I love the colours Camilla used and the way she coloured the image. The colour I love to use is Pink! What a great card Camila, beautifull colours! I like to use bright colours and my favourites are, Fuchsia, Lemon Green, Turquoise and Lilac. My favourite colour to use is blue...all different shades, right from baby, through turquoise, to navy! Ich benutze für meine Karten am liebsten rosa/lila oder verschiedene blautöne mit braun kombiniert. Wieder so eine tolle Karte... und die Zeit, hier deine Fragen zu beantworten, nehme ich mir einfach... dafür hat man ja die Chance auf die schönen Stempel. I think I use green most (had to think on that one) as it's an all year round colour and seems to get used with others a lot even if it's the background rather than the focus colour. Beautiful card, my colour is pink. Thanks for ths event. What an amazing card. I love the colours you have used. My favourite colour - I think - well at this time of year anyway are blues - love the cool icy feel. Gorgeous card! I think I mainly use vintage colours, cream, browns, golds and greens with the occasional red. What a lovely card, this stamp would be a lovely addition to my Whiff of Joy collection. My favourite colour for card making at the moment is pinks as its also my 3 year olds favourite colour too. Ich verwende viele Farben. Hauptsächlich rot,rosa,grau. Danke für diesen schönen Kalender!!! The main colour I use alot is white and then every other colour comes next lol. Die Karte ist sehr gelungen. Die Farbe die ich am meisten nutze, sind Blau und Grün. I try to use mostly earth palette colours :) I don't use pastels this often nowadays. Thanks for this lovely chane. morning all, i dont seem to have a fav colour for my cards but i do tend to lean towards blue a lot, love the chair by the way. Another great card. Probably the colour that I use most often is pink. I must say that I use most brown shades these days.. :D And a lot of pink! Ich mag am liebsten dunkelrot, rosa und braun. Lovely card:) The color I use the most is blue. Looks like I'm in the majority here by using pinks & purples on my cards lol!! Us girlies do like our girly colours. I've bought some lovely Stampin Up papers over the last 6 months so I think my New Years resolution should be to try different colour combos!!. It seems like I tend to use browns, greens and blues the most...Kind of interesting to see, cause I´ve never really thought about it before! Cross my fingers and hope to win this amazing stamp! I wasn't at all sure at first, so I checked back through my blog. I think it's going to be another vote for pink, closely followed by lilac. I go through phases and right now I am using chocolate chip from Stampin' Up! Hmmmm, my favorite color to use. Well, I have several fave color combos, don't know that I could say I use a single color a lot. I love pink w/ brown, teal w/ green, black and white and red, blue w/ green. Well, there are lots more! Can you tell I'm a bit indecisive? The card today is just gorgeous! You all do such beautiful coloring! Have you ever done tutorials to show how to color that nice or will I just have to practice, practice, practice and learn from my mistakes :-)?? so ein schönes Kärtchen, super toll. Ich liebe alle Farben, je nachdem, ich hab auch blaue Weihnachtskarten gemacht. Camillas card is gorgeous as usual! What colour do you use the most in your cardmaking? I use diferent colours. Now, for Christmas, i use maybe a litle more red. First of all - this card is great! And the answer ... my colour is red. This reminds me of the antique chair in my grandmother's home. I remember sitting on her lap years ago while she read me a story in a chair just like this one. What memories it brings back to me. Thanks so much. Such a beautiful card! I love that image! Congrats to Heather! I prefer to use soft colors,especially pinks and blues. Thanks for a chance Katharina!! Your blog is so beautiful and your stamps are amazing! well at the moment I am mainly using red and green (i wonder why) hee hee. This card is just gorgeous! I love the softness of the colors, oh gosh, I just love everything about it. :D I use a lot of purples (my favorite color) but I also use black a lot since it can really dress up a card and goes with nearly every color. I think the colors that I use the most are green and brown. Lovely card! I use a lot of oranges and reds/pinks. hhmm..the colours..red, bleu,brown,green..most of the time fall colours..i am a fall type..and i like these colours...i don't use bright colours very much..the chair is wonderful..
i think i use blue and purple the most. Lovely card btw! The colour I am using most in my cardmaking is purple. However.... I am trying to challenge myself to use other colours lately :)). How sweet! I used to have a chair just like that. It was so comfy to curl up in with a good book! The colors I use most in my cardmaking are various shades of brown, pink and red. I seem to go through brown paper the fastest - it goes with anything! My most used colour I think would be blue. Pink! Or blue! Maybe... green. Definitely pink! hmmm.....I use lots of colors but I like the earth tones and right now I am useing a lot of kraft color cardstock with navy blue and brown inks (from Stampin' Up!). I always seem to make room for some shade of green in my cards. Fantastic card! And my most used color in stamping is Chocolate Chip. It goes with everything. Meine Lieblingsfarben für Weihnachten sind grün/rot, rot/weiss und blau/weiss... aber auch rosa/braun gefällt mir gut. The colour I use the most, is definetly brown! Can seldom make a card without that colour at all! Pink is my favorite color, so naturally it's the one I use most!!! The color I tend to use most now is various shades of brown. Lovely artwork! I use any jewel tone colors. I change with the seasons! I've been using reds and greens for my Christmas cards, which I have to say are all finished today!!! Now starting into pinks and greens to look forward to spring. I use Blues a ton. But I have 2 boys so go figure. Orange ist die Farbe, die ich am meisten benutze. Durchschnittlich jede 2te Karte ist orange oder hat Orange Anteile :)! Ich liebe Orange :)! Beautiful card :o) I think I use mainly blues, pinks & purple tones in my card making. Hmm just checked my cards and I do use a lot of different colours. But blue and green a lot recently. That is a hard question, I use so many colours. I am not sure I can answer which I use the most! oop! I am a bit late today, but have just gotten back from my staff Christmas dinner - and tasty it was too!! My most used colour? Erm, given that it is Christmas, I would have to say red!! Otherwise, I don't think that I have a particular colour that stands out most!! I am so excited to win this blog candy. I will email my info.